There are a couple of good lessons here, one of which is: don't go on Antiques Roadshow with something unless you are one hundred percent sure it belongs to you. Margaret Smith showed up on that program in 2006 with a marriage license (right) that bore the names "Margaret Elder" and "David Crockett," the latter being more commonly known as "Davy" Crockett, a legendary frontiersman who was reportedly undefeated when fighting bears though he ended up 0-1 against Mexicans. Crockett was engaged to be married in 1805 but his bride-to-be is said to have changed her mind. The marriage never took place, and the unexecuted license was returned to the courthouse in Jefferson County, Tennessee. It stayed there for somewhere around 130 years. According to Mrs. Smith, her uncle was a court official in the 1930s and 1940s, and during a spring cleaning of sorts one year he took home some papers, one of which was the Crockett license. Allegedly, he had rescued it from being thrown out, and he gave it to Smith's father. Sometime in the 1990s, county officials learned that Smith had it, and told her they wanted it back. No deal, said Smith. There things stood until a couple of weeks after the ill-advised TV appearance, when the county's attorney wrote her to say that in their opinion, she was in possession of a "protected public document" in violation of state law. When she said forget it, the county sued. The case went to trial in 2009. 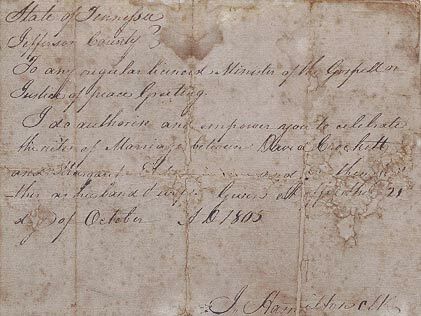 The trial judge found that it was unlikely that the county would have intended to throw out Davy Crockett's marriage license and so it belonged to the county. The explanation given as to how this got out of the records down there, that — that dog just won't hunt…. [T]he circumstantial evidence is [that] a member of Mrs. Smith's family took that document. I don't care if there's a building named after him or half of the county is named after him … It's Jefferson County's document. She's got to return it. Last month, the appellate court agreed that the preponderance of the evidence weighed in favor of the conclusion that said dog indeed would not hunt. Mrs. Smith raised several issues on appeal, but the only interesting one for our purposes was her argument that at the time Uncle Harry rescued/stole the document, David Crockett was not a "historically prominent" figure and the trial judge should not have taken judicial notice of facts suggesting otherwise. Smith's argument was apparently that Crockett had been "largely forgotten" until Walt Disney made the 1950s TV series about him. But as the court pointed out, if the document really had no historical significance then Uncle Harry probably wouldn't have taken it in the first place, and besides, it did. If you're interested, the opinion (PDF) also discusses whether the video of Mrs. Smith's Roadshow appearance was admissible under various hearsay exceptions. Since you're probably not, I'll just tell you it wasn't.